Kukris as we know has always been that sharp thick curved weapon that has played great historical roles during times of battle. After the end of world war II, Kukris never got to see real actioin again and to remember its key role that led to unification of Nepal and the bravery of legendary gurkhas, kukris are now made of of beautiful wooden and horn scabbards. These kukris are displayed at ones houses to remind the great romance and the extra ordinary accounts of bravery this kukri evoked. Dhankute and Chainpure villages located in east of Nepal are two famous places where decorative kukris are made. Dhankute kukris are always made of wood or horn and will have Nepal's national symbols while Chainpure kukris are always wood but with different handles and carving. 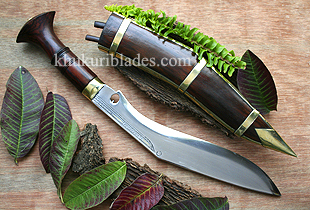 This Chainpure Kukri is made of indian rosewood scabbard and handle, simple yet very attractive.